We strung up our globe (a 23rd birthday gift to Dave from me) between the rafters and I love looking at it when we're laying down on the bench. For a little nod to our own kitchen, we decided we'd do white shelves above a black counter. We don't really have any kitchen-y toys yet so we're using pretty fruit juice cans and an old olive oil contrainer. I love their vintage-feel. I think it'll be fun to use actual leftover food containers (like empty mini cereal containers) to add "food" over time. I also thought it would be fun for Christian to play "bartender" when we have parties/ bbqs. (ok- yes, I know how bad that sounds but I'm not talking only alcoholic drinks here :) We'll put the different drinks we have to offer up on the shelves - ie coke, bottled water, orange soda, etc- for people to see their options and then they can tell the kids what they want so they can fish it out of the coolers for them. The beautiful old adirondak chair was given to me by my friend Rebecca of Acanthus and Acorn and Christian just loves it! The bass that hangs is the first bass I ever "caught." I was 4 years old and my dad had it mounted. It reminds of of the fishing trips I used to take with my dad when I was little - playing Barbie's and caring more about the surrounding waterlilies rather than the fish. It has been moving from house to house with me with no place to go, and finally, it's found a home. (ps- I'm not sure I've even caught a bass since... my dad's an awesome bass fisherman and has even been on those fishing shows... this apple falls far from the tree.) The botanical prints are different plants (and weeds!) we have around our yard. Christian & I picked them and photocopied them with the printer. I labeled them and added some personal stories/ thoughts on any that have special meaning. To see the how-to details, click here. Do you spy the "real" tenant in the playhouse? Just under the painting... "Spidey" earns his keep by eating mosquitoes. This playhouse is not for the squeamish! ...But I think Dave & I might actually like the playhouse more than him. We love seeing him have so much fun and being so excited, so in that sense, it's just as much of a gift to ourselves as to the kids. It's funny how that works. Anyway, hope you're having a great week & enjoyed the tour!! Amazing! I love it. What a gorgeous place, Christian is a lucky boy. So cute! I want one for myself! I love this little spot! So rustic, yet so put together! Thanks for including the source for the rug - it caught my eye right away! And I know what you mean about not having a girl - I need to create a pretty room! I love this! I am currently redoing our pool house and making it fun for our two boys as well. (no girls yet either!) It is about the same size as yours I think. You can check out the sloooow progress on my blog. Thanks for sharing, it looks so cute and fun! How fun!! What a great place to enjoy with your family!! And where did that fabulous outdoor rug come from?!?!?!?!? Super cool! That is not like the playrooms I had in the 80s, I can guarantee you that! Very cool and loving his little chair. Oh my gosh..even your shed is stylish! Love it!!! girl, you are really good! You know you are becoming a confident designer when you hang up a globe like that! I love your style. My favorite room to date though is probably that shelter bedroom! You are so creative. I LOVE it. My kids would love a playhouse like this! Great job, and thanks for sharing! Have a great and enjoyable summer! I would love to have this in my backyard.....sooo fabulous! Aabsolutely love this shed! I want a fun place to hang out like that - ha! Great job! I always wanted a playhouse in my yard, so I'll live vicariously through you and your family for a while! Love the rug, and tell Christain that I think his sticks are pieces of sculpture! That is the coolest shed/playhouse ever! I bet your little ones will have a lot of fun here over the summer! This looks like so much fun! smiles. Wonderful! I would have DIED for a playhouse like this as a kid (though my sis and I would've probably insisted on more pink! ;)). You did a great job and I'm sure the family will get years of enjoyment out of it. really amazing, best looking shed i've ever seen!! So darn cute. Can't believe that is the inside of the shed. How creative. Makes me want to go out to Lowes and pick one up! It looks amazing and love all of the personal touches and meaningful objects. You are so good at what you do. Thanks for the idea of the botanical prints, my four children bring me treasures all the time, everyday, every second, every...you get the point. What a great way to capture their story. Does it have side windows or no? and you mentioned getting away from the bugs... are there screens? It is so hot here, windows with cross breezes would be nice and sliding screens too- (to keep out the mosquitoes). Otherwise...where could I get me a bucket full of spiders? I wanna come play there! Spidey doesn't scare me in the least! It looks so good...and the chair has found a perfect home! The shed has such a fun,hip vibe..better watch out or before you know the boys will be hosting the girls in their "dude" shed!!! I have that same rug from Overstock.com. It is wonderful and looks even better in person. Great job...it looks livable now. So is that rug the Sand/Black color? this is so great and beautiful! its the perfect mix of parent and crazy boy friendly! have a great summer in there! this is jaw-dropping fantastic! i honestly am in shock a little bit - in a good way! beautiful work, lauren. i love that you mix beautiful and practical. looks like a wonderful place for your family to relax. we have a shed out back and i never in a million years would have thought it could be used in this way...inspiring! This is insane! I want one! I can't believe how big and functional it is?! Years ago we did a playhouse and unfortunately, it was nothing like this. We sold the house and I swear, this has me wanting to go back there and re-do the shed/playhouse in back! Your little guy seems to be having a blast! Rug's from overstock.com called the "matrix" and I think it's the sand/ black option. This is absolutely amazing and wonderful, Lauren! I love it!! I have so much catching up to do! This is just amazing, what a fabulous before and after. I cant even believe this playhouse is in the same spot as old, falling down house from the before photos. The rug is my favorite- I LOVE the pattern! Love the rug! Overstock.com too... fabulous. The boys are adorable. Wow, the baby is getting so big. holy moly, only you could make a home depot shed look this cool. So fun! OH....I see many good times in that little shed. Your biggest little guy looks quite at home. Great job! Your shed is fabulous. Your boys are going to have the best memories of this! Picking my jaw up off the ground! How clever is this!!! Stunning! I think I just have to pilfer this idea for my backyard!! Thanks bunches for sharing!! 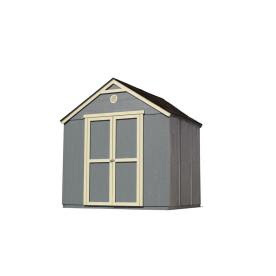 What fun to decorate for the holidays this shed will be! I ADORE what you've done with this shed. It's such a fun space and it is so fresh & cozy! All of the little personal details add so much character. I especially love the botanical prints. Very fun. Thanks for sharing! The playhouse is GORGEOUS and so is Christian and Justin. I love what you have done here - such a delightful space, and loving the stick collection and the bass and the dog pillow and the bugs. Perfect. You are a great Mom! so stinkin' cute!!! love the geometric rug! Such a great project! It will be a great spot for you and your family!! Little boys (especially adorable ones :) need a place to hang out too--the little guy's "office". I adore the sticks on the shelves and can so identify with it! Great place for everybody-including spidey! This turned out amazing! Your boys must love it! ooh, my boys would so flip over this shed! What a great project. Maybe we could do that to replace the weeks in our back yard, since I'm an utter failure with plants! your kids are going to have the absolute best memories of this.